Audiolab announces its first headphones: M-EAR 2D and 4D in-ears | What Hi-Fi? Audiolab has teamed up with IEM specialists ACS to bring two pairs of M-EAR buds to the high-end market. Audiolab has long been known for its hi-fi components, particularly amplifiers, CD players and DACs (including the Award-winning M-DAC). But headphones? This is new ground for the British brand. The M-EAR 2D (£300) and M-EAR 4D (£600) are landmark products in the company’s catalogue. Aimed at the higher end of the market, they will have to establish themselves next to the likes big hitters like Shure, Sennheiser and AKG. Audiolab has drafted in ACS to help design its first headphones. 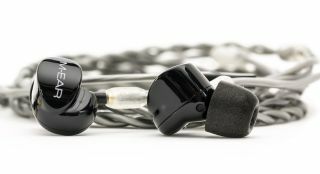 ACS is renowned for making in-ear monitors across a range of industries, including live music, broadcasting and motorsports, and also has its own consumer in-ear range. Both M-EAR models feature ACS technology, including SSI (‘sound stage imaging’) which aims to widen the soundstage. They also incorporate balanced armature drivers – the M-EAR 2D has a two-way, two-driver design, while the M-EAR 4D has a three-way design with four drive units. The M-EAR 4Ds’ bass drivers also have a ported balanced armature design. The M-EAR 2Ds and M-EAR 4Ds come with a 1.45m detachable cable, six pairs of memory-foam ear tips in three different sizes, and a carry case. There’s also an in-line microphone for hands-free calling, which is designed to work well in noisy environments. Both models will be available from June.